Prototyping Interfaces – Interaktives Skizzieren mit vvvv from Prototyping Interfaces on Vimeo. With knobs and motors, wheels and cameras and bits of Play-Doh, a series of elegant interactive experiments provides physical controls to screen interfaces. Prototyping Interfaces, the book, can show you how, all with loads of pictures and examples in free-as-in-beer (for non-commercial use) vvvv. (Preferred pronunciation is “V-4,” generally, in English or German.) 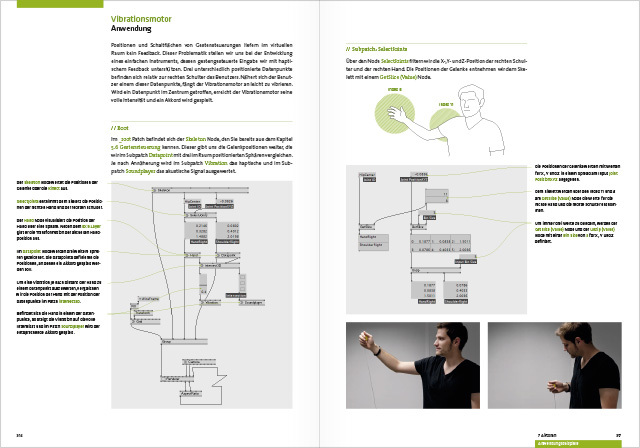 The book is in German, and the software is Windows-only, but the videos (and the examples in the book, for that matter) are illustrated visually. Standen am Ende des Designprozesses früher statische Gegenstände, so sind es heute zunehmend Interaktionen – Dinge, die sich verhalten. Das verändert nicht nur den Gestaltungsprozess grundlegend, sondern auch Ihr Leben als Gestalter! Zunehmend steuern Sie nonlineare Prozesse, die auf ein Ziel zuführen, das am Anfang des Prozesses nicht exakt feststeht. Sie nähern sich diesem Ziel iterativ in interaktiven Skizzen und in der Arbeit mit Prototypen. Sie nutzen dafür neue Werkzeuge wie vvvv und Arduino. Und Sie entdecken in der Arbeit mit Prototypen spielerisch Antworten auf Fragen, die Sie noch gar nicht gestellt haben. Das Buch »Prototyping Interfaces« führt Sie allgemeinverständlich in vvvv, Arduino, Tracking-Verfahren und Display-Technologien ein. Auf dieser Grundlage eröffnet es Ihnen anhand unzähliger Praxisbeispiele die Möglichkeiten des Prototyping und erschließt Ihrer Kreativität damit vollkommen neue Dimensionen. Es sichert Ihnen die Führungsrolle im Designprozess, kann Ihre Eintrittskarte in die Agenturen sein, von denen alle gerade träumen – und es eröffnet Ihnen Welten, die Sie heute noch für Science Fiction halten. Die Zukunft liegt näher als Sie glauben! Not too long ago, the outcomes of a design process used to be in the form of a static medium. Today it is increasingly interactions – things that have a behavior. This not only fundamentally changes the design process, but also your life as a designer! You are increasingly driving nonlinear processes, which are aiming towards a goal, that is not exactly defined at the beginning. The approach to this goal is very iterative through interactive sketches and by working with prototypes. Therefore you use new tools like vvvv and Arduino. And by working with prototypes, you’ll discover answers to questions that you haven’t even asked before. The book »Prototyping Interfaces« introduces you to vvvv, Arduino, tracking methodes and display technologies, in an understandable way. Building on top of that, it opens new dimensions for your creativity, through many practical examples and the endless possibilities of prototyping. This enables you to be in a leading position of the design process and can be your ticket to the agencies that everybody dreams about – and it opens new worlds of possibilities that you think are still science fiction today. The future is closer than you think!